Argus made a variety of cameras over the years, almost all of them manual-set, but they were late in the game for meters. They sold a number of different meters, including four with the L3 designation. According to the Argus Collector's Group, there is no special marking on the meters to differentiate them, so the "Mark 1, Mark 2..." designations are my own. This is a Mark 2. It has a match-needle system, which makes it very easy to use. Like the previous L3s, it was made in East Germany by Metrawatt. The rear panel states that Argus is a division of Sylvania, so that puts the date of manufacture somewhere between 1960 (when it was introduced) and 1962 (Sylvania sold the company after that). What surprises me most on this particular model is that it has a neck chain but no provision for a "foot." It would have slid nicely into the accessory shoe on the venerable Argus C-3. 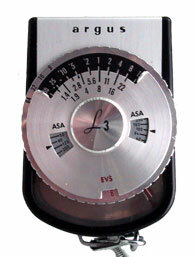 Since some C-3's had a separate flash coupling anyway, that accessory shoe was a great place for a meter.